It’s no secret that the New York Rangers boast one of the deepest groups of forwards in the NHL, but what’s really exciting is what’s on tap for the next generation. Our overview stuck to the basics, like Rick Nash and his potential for scoring 40 goals or Derek Stepan and his new deal. But beyond the upper echelon lies a profound group of forwards worth taking a closer look at. The fun starts with Kevin Hayes, who registered 17 goals in 79 games last season and added seven points in 19 playoff games. The 23-year-old from Boston was acquired as a free agent in 2014 after being drafted by the Chicago Blackhawks in 2010. He’s a versatile forward, which explains why the Rangers aren’t quite sure where he’ll fit in this coming season. There is the distinct possibility that Hayes will start at centre, but he’s also good enough to slip to the wing. With Jarret Stoll on the roster and the potential for an Oscar Lindberg sighting, the Blueshirts may stick Hayes elsewhere to provide a little balance in the forward attack. Hayes spend the majority of last season as the third line centre, but he struggled in the dot and won only 36.3 percent of his faceoffs. Stoll will rectify those numbers overall and will likely take the third line spot, with Dominic Moore occupying the fourth line. With Derick Brassard and Stepan taking the top two lines, that theoretically leaves Hayes to the wing somewhere in the top six. That’s not bad. Not bad at all. Chris Kreider is another factor. The 24-year-old from Boxford is another top six forward. Drafted by the Rangers in the first round in 2009, Kreider scored 21 goals last season for a total of 46 points in 80 games. He’s a speedy player and can score goals, plus he can play centre if need be. Seven of his goals came on the power play last season and he owns the size at 6’3, 226 pounds. Kreider was trouble for the Washington Capitals in the post-season, where the Rangers forward made life interesting for the opposition. He had seven goals in 19 playoff contests, but sent Ovechkin and Co. into fits with his aggressive play. And then there’s that YouTube video of him leaping out of a pool. Seriously. What about J.T. Miller, you say? 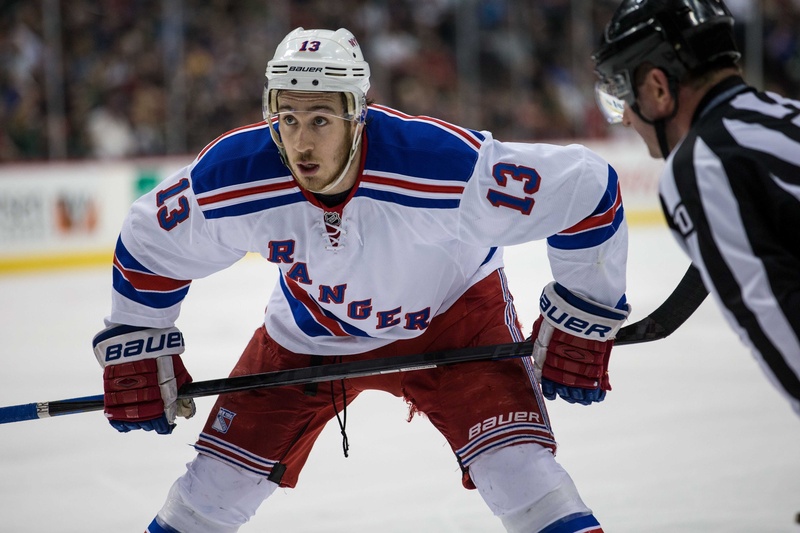 The 22-year-old winger was drafted by the Rangers in 2011, going 15th overall. He recorded 23 points in 58 games last season, adding eight points in 19 playoff games. Miller is another quick and versatile forward in the Rangers collective, boasting the ability to play either wing or centre. He can play a power forward’s game, too. In the Eastern Conference Final, Miller saw time with Brassard and Nash and certainly benefited from the experience. He scored his first career playoff goal in New York’s Game Six drubbing of the Tampa Lightning and managed four points in that contest. The Rangers will hope for more of the same from Miller, who has some top-tier talent to work with. Finally, Jesper Fast. The 23-year-old Swede boasts a good set of hands and can skate like the wind. He was responsible for 14 points in 58 games last season and had six points in 19 playoff games. He seemed to find his rhythm with Kreider and Stepan in the playoffs, managing five points against the Capitals in the second round as part of the unit. Fast had two goals in Game Three against the Lightning, too, and inked a two year contract extension in the summer. He’s not the biggest player on the team at 6’0, 185 pounds, but he can make his way through traffic areas and endure punishment to make plays. With this group of four, the Rangers have a lot to like about the near future. These are all budding impact players, skaters with the ability to turn games around. Beyond their top group of elite forwards, the Blueshirts have a secondary group worth betting on. Fast, Miller, Kreider, and Hayes should all put up good numbers this season, bolstering this already strong group’s point-getting potential.